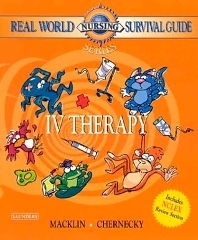 Nursing students struggling with the difficult area of IV therapy need a resource that guides them through the essentials and highlights what they need to know. This guide offers a visual, engaging approach that clearly explains topics such as: equipment and infusion devices, principles of peripheral and central venous therapy, peripheral and central complications, and special concerns for pediatric and older adult patients. The first section of the book presents content in an illustrated multi-modal approach that explains key concepts and reviews topics with a range of engaging learning activities. The last section contains 115 NCLEX® review questions with answers and rationales for correct and incorrect answers. Narrows the gap between the facts learned in school and the wisdom that nurses need to survive in the real world. active-learning strategies to engage nursing students of all ages, backgrounds, and learning styles. Consistent headings divide information into manageable units and reinforce a logical learning strategy. Icons for lifespan considerations, cultural implications, web links, caution/danger, and calculations help the reader identify special content in the chapter. Memory-reinforcing mnemonic devices and a variety of interactive activities promote learning. Clinical terms and shorthand expressions are highlighted in parentheses and another color after the layperson's explanation expose students to terminology that they will hear in the hospital setting. Boxed "Take Home Points" offer succinct points of advice that reflect years of nursing experience that students can use to prepare for their clinical rotation. A full-color insert illustrates concepts and principles of IV therapy, including illustrations of various complications. NCLEX-style questions are referenced by chapter and provided in a convenient 2-column format with answers and rationales that can be covered with a flap on the back cover. Features original cartoon illustrations and a theme monkey cartoon character that walks the student through difficult subjects with a light-hearted, engaging approach to learning. Separate chapters on pediatric and older adult patients discuss important age-related considerations associated with IV therapy. Includes a chapter on one of the fastest growing fields in nursing — community care — and how it affects nurses, patients requiring IV therapy, and their caretakers.